WLC’s resident sybarite, Lucy Shaw, heads to the new Sushisamba in Covent Garden for wagyu gyozas, poussin teriyaki, yuzu saké and an edible zen garden. The concept: Sushisamba first shimmied into our lives in 2012, when it opened on the 39th floor of the Heron Tower in London’s Liverpool Street, bringing a slice of Brazilian sunshine to cold winter nights in the capital. Known for its jaw-dropping views, buzzy Brazilian beats, flappingly fresh sushi and killer cocktails, the original is a special occasion venue – somewhere to impress a date or celebrate a promotion. It’s also home to London’s most expensive dish – the £1,000 kobe ishiyaki, formed of 1kg of prized kobe beef cut into thin slices of melt-in-the-mouth meat that are cooked on a hot stone at your table. Those keen to try it have to order it two days in advance. 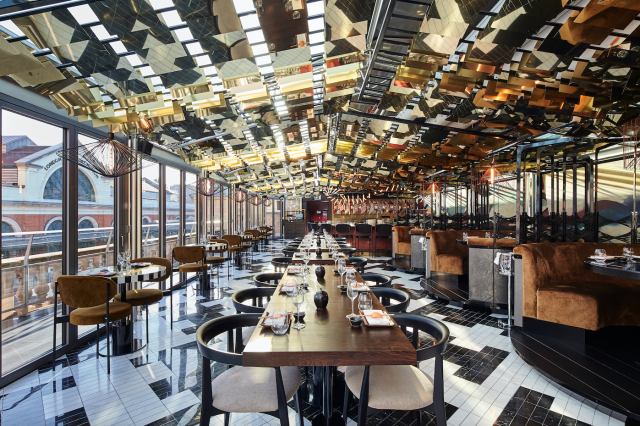 Last month Sushisamba, which has outposts in LA, Las Vegas and Amsterdam, took its Japanese / Brazilian / Peruvian fusion concept to Covent Garden, taking over the Opera Terrace within the Grande II listed Market Building overlooking Covent Garden Piazza. The décor: I was worried a little of the magic would be lost without the high rise location and the heart-thumping thrill of whizzing up to the top floor in the restaurant’s Wonka-like lift. Accessed via a spiral staircase, while the journey to the younger sibling is more sedate and the location less awe-inspiring, the designers have done a good job at capturing the vibrant spirit of the original in a dramatically different setting. On our visit on a particularly spiteful November day, its location atop the Market Building afforded us festive views across the wind-whipped piazza, Christmas lights twinkling in the distance and the glint of a disco ball illuminating the restaurant’s geometric floor as if awaiting a white suited John Travolta. 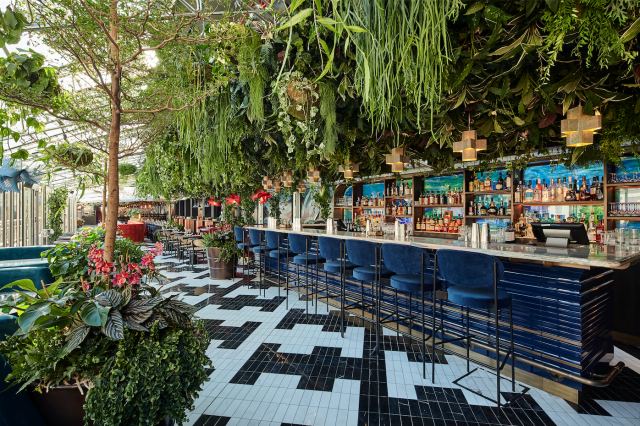 Designed by the achingly hip Too Many Agencies, one of the standout features of Sushisamba 2.0 is a ‘live ceiling’ installation fecund with Japanese and South American foliage. The abundance of greenery brings the outside in, tipping its hat to Covent Garden’s once blossoming flower market. Behind me, a young Japanese chef wearing a Rambo-like red bandana chops hunks of salmon into silky sashimi at the marble-topped sushi bar. The food: Executive chef Andreas Bollanos presides over the menu, which stays faithful to the City original but has enough new dishes to keep the offering fresh. All dishes are designed to be shared, and arrive as and when they’re ready. This can be problematic if you order abundantly, as you end up with a table overflowing with food and the unwelcome pressure of having to eat quickly. On a couple of occasions we had to ask the kitchen to slow the service down, so that we could take our time over the dishes and savour them. The best way to tackle the menu is by ordering one thing from each section. One of the highlights of our feast was the first thing we ate – a simple sounding bowl of green bean tempura with decadent black truffle aioli. I’m not sure if it was because my companion and I were ravenous, but the lithe beans in their light, salty batter were heavenly, particularly when slathered in the rich, creamy, earthy aioli. We devoured the lot in seconds. Signature dishes: The yellowtail and avocado crispy taquitos are a must. Wonderfully zingy on their own, they come with a little pot of hot sauce foaming with froth, which adds a warming lick of fire to the fish. The wagyu gyozas – little parcels stuffed with juicy beef – were every bit as salty and savoury as I was hoping them to be, while the salmon ceviche swimming in a piquant pool of leche de tigre bobbing with sweet macadamia nuts came flecked with gold. The star of the show in the teriyaki poussin dish, served from the restaurant’s robata grill, was the yuzu-laced Japanese mayo, which was so sublime, I may have licked the pot. The poussin was delicately cooked, its moist and yielding flesh sweetened by the teriyaki glaze. 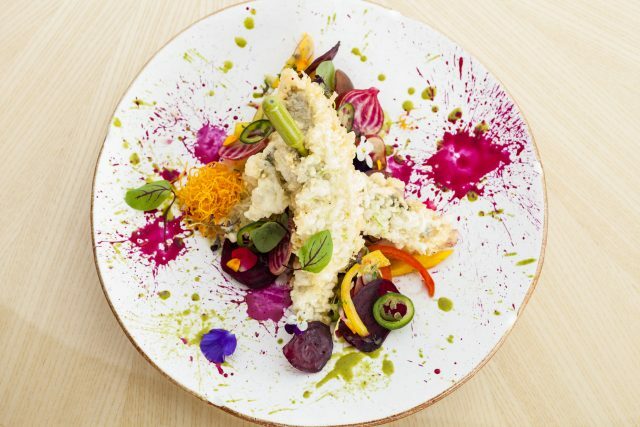 If you’re in it for the ‘gram, then you have to order the sea bass tempura, which looks part crime scene part Jackson Pollock painting. Served with a pipette filled with jalapeño sauce rammed into it, the batter was a masterclass in balance and precision – light as a dragonfly wing, wonderfully crisp, and without a hint of grease – my only criticism is that there wasn’t enough of the jalapeño sauce to drizzle on it. The drinks: The unexpected highlight of the evening was our affable sommelier, Dominik Ponomarew, who plied us with wine, telling us the story behind each pre pour. Master mixologist Rich Woods’ cocktail list is worth exploring at some point during the evening, and offers many a tempting apéritif and decadent digestif. My Chucumber offered a fresh, fragrant, appetite-whetting combination of cucumber, lime, shochu, plum sake and Maraschino liqueur, and was so light on its feet it was dangerously drinkable. A sparkling saké served from a pretty pale blue bottle offered the clean, crisp flavours that pair so well with sushi. Another surprise of the evening was a lip-smackingly fresh Aligote from Burgundy, which had bags of character. A lees-aged white Rhône from Domaine de Saint Cosme meanwhile, made from Marsanne, Viognier and Picpoul grown on limestone rich soil in Saint Martin, delivered notes of dried apricot, white peach and cream with a hint of flint. Who to know: Whisky, wine and saké lovers should seek out sommelier Dominik Ponomarew, who boasts that enviable combination of impressive knowledge, effervescent enthusiasm and an easy charm that makes you feel like you’re being let in on an exciting secret. Don’t leave without: Sticking around for dessert – if you have room. 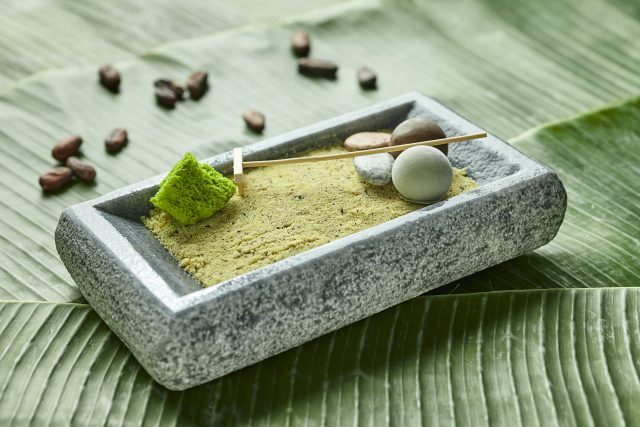 Made with a yuzu curd and bergamot biscuit base, our ‘Zen Garden’ pud was exactly that, and came complete with edible sand, chocolate stones and a tiny wooden rake. To pair with it, Ponomarew poured us a refreshing yuzu saké, which gives limoncello serious competition. Last word: Fans of the original Sushisamba should pay a visit to its little sister. While it may lack the wow factor location of its Heron Tower sibling, there is a lot to love about this second site, which was packed with an eclectic crowd on our visit. Whether you’re heading there for a blowout feast or a cocktail and a few bowls of green bean tempura, the sunny soul of the original has been cleverly transported to Covent Garden, giving weary tourists the perfect excuse for a Peruvian pit stop.